Kotka is a city and municipality of Finland.Kotka is located on the coast of the Gulf of Finland at the mouth of Kymi River and it is part of the Kymenlaakso region in southern Finland. On the 28th (Sat), hike along Santalahti Nature Trail, look for all kinds of wild species at Riverside Park, go for a walk through Linden Esplanade, then step off the mainland to explore Varissaari - Fort Elisabeth, and finally kick back and relax at Beach Mansikkalahti. To see ratings, reviews, photos, and tourist information, use the Kotka trip maker . Mumbai, India to Kotka is an approximately 18.5-hour flight. The time zone difference when traveling from Mumbai to Kotka is minus 3 hours. Plan for cooler temperatures traveling from Mumbai in September, with highs in Kotka at 17°C and lows at 9°C. Wrap up your sightseeing on the 28th (Sat) early enough to travel to Koli National Park. Kick off your visit on the 29th (Sun): hike along Paha-Koli Hill, then stroll through Akka-Koli Hill, then explore the striking landscape at Uhrihalkeama, and finally stroll through Kolinuuron kierros Nature Trail. For ratings, photos, maps, and tourist information, go to the Koli National Park online holiday planner . Traveling by car from Kotka to Koli National Park takes 5.5 hours. Alternatively, you can fly. In September, daytime highs in Koli National Park are 15°C, while nighttime lows are 7°C. Cap off your sightseeing on the 29th (Sun) early enough to travel to Tampere. On the 30th (Mon), relax and rejuvenate at some of the top local wellness centers, tour the pleasant surroundings at Rauhaniemi Beach, and then stroll through Riihiniemen Uimaranta. For traveler tips, where to stay, more things to do, and other tourist information, go to the Tampere day trip tool . You can drive from Koli National Park to Tampere in 6 hours. Another option is to fly. September in Tampere sees daily highs of 17°C and lows of 7°C at night. Finish up your sightseeing early on the 30th (Mon) so you can catch the train to Turku. Start off your visit on the 1st (Tue): take a stroll through Naantali Old Town, kick back and relax at Ispoinen Beach and Sauna, then admire the landmark architecture of St Henry's Ecumenical Art Chappel, and finally head off the coast to Vepsa Island. For reviews, other places to visit, photos, and tourist information, read Turku road trip tool . You can take a train from Tampere to Turku in 2 hours. Alternatively, you can drive; or do a combination of train and flight. In September, plan for daily highs up to 18°C, and evening lows to 7°C. Wrap up your sightseeing on the 1st (Tue) to allow time to drive to Helsinki. 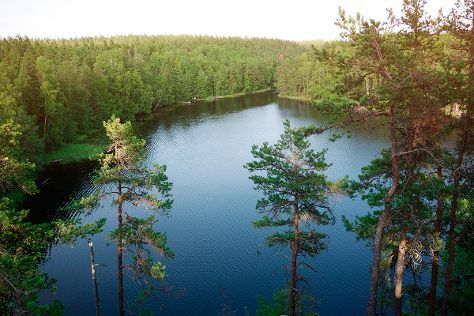 Get outdoors at Nuuksio National Park and Hietaranta Beach. Deepen your sense of the past at sights like Rock Church and Uspenskin Cathedral (Uspenskin Katedraali). There's much more to do: brush up on your military savvy at Sea Fortress Suomenlinna, pause for some serene contemplation at Helsinki Cathedral, wander the streets of Katajanokka, and get to know the fascinating history of The Esplanadi Park. To find other places to visit, traveler tips, and more tourist information, use the Helsinki tour itinerary maker . Getting from Turku to Helsinki by car takes about 2 hours. Other options: take a train; or fly. October in Helsinki sees daily highs of 10°C and lows of 1°C at night. Cap off your sightseeing on the 4th (Fri) early enough to travel back home.